Every night at sundown, some 20,000 crows fly eastwards en masse in a disorganized dark parade to their communal night-roost spot at Still Creek in Burnaby. Crows, like people, congregate for a variety of reasons: community, food, mating, and safety. The nightly crow migration is an awesome sight in East Van when large murders of crows alight with mysterious synchronicity on power lines, treetops, and building eaves and fill a neighborhood with black, cawing bodies. Then they take off again and the Hitchcockian cacophony is eerie and wondrous at the same time. 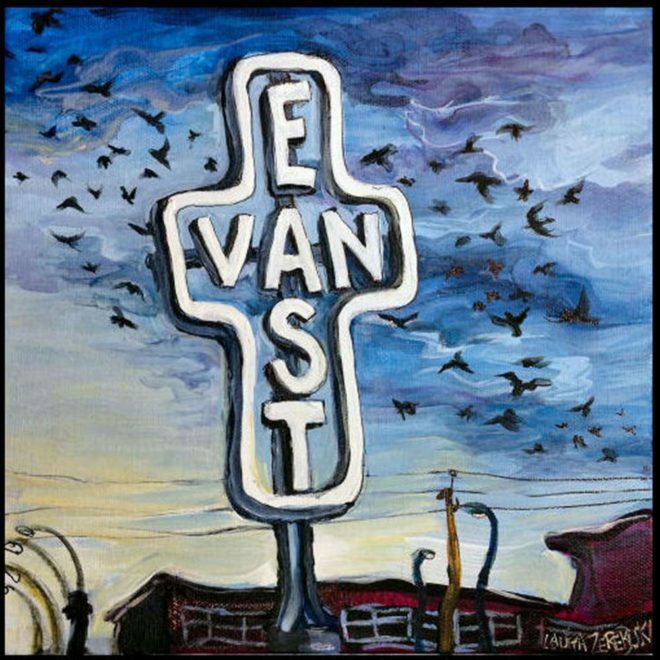 This little painting was a quick re-imagining of the diagonal stream of crows over the ubiquitous East Van cross at twilight.